God’s Presence in the Prairie | Walk with us! Originally from Indonesia, Fr. 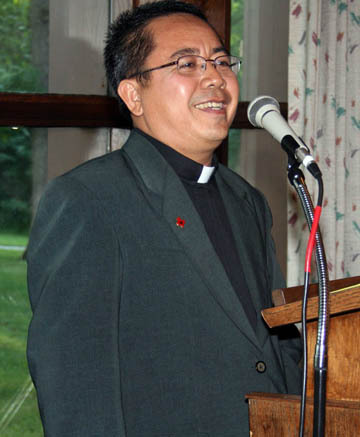 Vincent Suparman, SCJ, volunteered to be a missionary and was soon assigned to Papua New Guinea. In August, he began his new assignment: serving in rural South Dakota with the Lower Brule Pastoral Team. When people think “mission” they often think of lands far beyond the shores of the United States. Yet there are many home missions throughout North America. Much of the ministry of the Lower Brule Pastoral Team is on the Lower Brule and Crow Creek Indian reservations. Fr. Vincent Suparman during the province jubilee celebration in July; Fr. Vincent celebrated his 25th anniversary of vows. On one Sunday before noon I reached St. Catherine Church at Big Bend for a mass. I got there about 40 minutes before mass began. Shortly after parking my car I went into the reconciliation room hoping that there would be a few parishioners coming for confession. Nobody showed up. As I gave my Sunday homily, I saw four people sitting far back on the pews. I felt like I was in a strange place facing a vast meadow. Then I recalled what my spiritual director said, “We don’t pray to make God present to us. God is always present everywhere. No matter how many people there are in the prairie here in Big Bend and its surroundings, the Holy Spirit is always there. God does not depend on how many people there are to be present among us. We pray to make ourselves present to God.” I continued my own reflection after communion. In my opinion, also true for us SCJs. Sadly, we too often are not present to appreciate the beauty of nature, grace, and the love that overflows within the ordinary moment of our lives. Bounty is there, but sometimes we do not see it. We easily find excuses: fatigue, haste, and so on. These excuses prevent us from reflecting on our spiritual lives more deeply to appreciate what the moments of our ministry, spirituality, and lives hold. Our mission goal is not to try to make God present, but rather to make ourselves and the people present to God. Nonetheless, in order to be prophets of love or God’s instruments, we ought to equip ourselves with knowledge, skills, and wisdom by which we proclaim the Good News. The commissioning of the disciples (Matt 28:19-20) –– that is interpreted as mission task –– is not meant to be lived in black and white, nor is it meant simply to be going off to work, coming home, having supper, preparing for the next day, and going to bed. We have much to share and say to help our community and the people grow in faith, hope, and love in this challenging world. No matter how busy we are, we must be careful not to let ourselves get burnt out. We can think of the days after having a retreat, pilgrimage, or workshop. We regain our health and energy after having been out of our normal routines. On the way home we think that nothing is as sweet as returning to the ordinary, our work, and being in the everyday life. Life is given freely. All our needs are provided for. Water, grass, and land in which we raise our cattle are signs of God’s presence. There are more signs of God’s presence than we can think of. Plants and animals are there for our nourishment. We have flowers for beauty, trees to shade and shelter us. Do we possess them? We possess none of them. It is ours to use as we are passing through and walking by as we continue to walk the path to manifest God’s love and mercy to the people we serve.